Sometimes I get trapped at work without any way to get lunch. Or I’ll be so busy that all I can do is run out to McDonald’s or Taco Bell and bring lunch back to my desk. And since I work nights, delivery options are fairly limited. So Jimmy John’s is an excellent way to get good food fast — delivered. And with online ordering, the whole process is a breeze. I ordered a turkey sub (no sprouts! ), oatmeal-raisin cookie, and a Coke. A coworker got in on the action and ordered a Vito #5 with peppers. Total cost: $13, and you can leave a tip on the credit card. The Jimmy John’s tagline is “Subs So Fast You’ll Freak!” Yes, I ordered at 6:31 p.m., and at 6:49 p.m., the driver was outside my building letting me know my food was ready. Very fast. I didn’t freak, but I was pleasantly surprised. 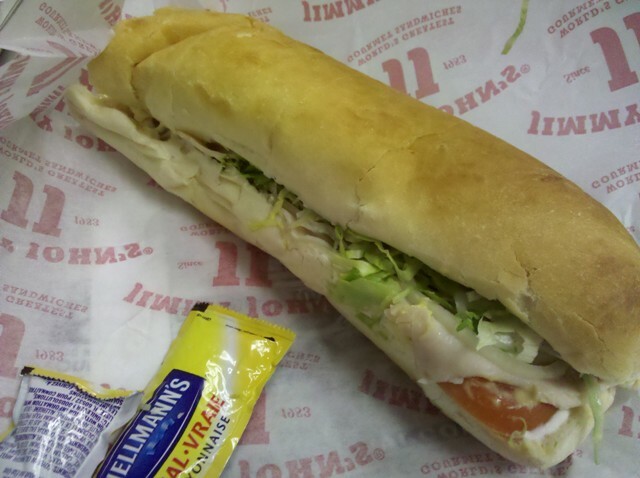 Jimmy John's turkey sub with dijon mustard and mayo. No sprouts.